13 May 2019 "Why Weight Matters" and "Center of Gravity and Optimising Manual Wheelchairs"
Wheelchair manufacturers often promote having the lightest wheelchairs made of the lightest materials. Does this matter? And, if so how much? Understanding the benefits of a lighter wheelchair is essential for the user and anyone involved in the wheelchair industry. The decisions you make when ordering and setting up a wheelchair will impact wheelchair weight and efficiency and can have a significant effect on user function, independence and safety. When selecting an appropriate manual wheelchair, we often focus on the features and benefits of the selected product; or default to the familiar. However, we may be doing our client’s a disservice by not considering the form and function of the wheelchair. How does design and material selection impact functional performance and can it make a difference for our clients? This presentation will discuss basic material science and the impact that frame construction may have on our client’s ability to function more independently. 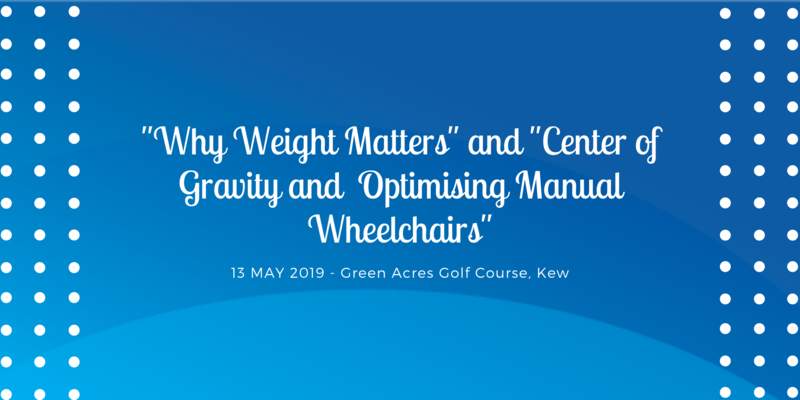 We will help to define Centre of Gravity (COG) and will examine the impact of changes in COG and discuss the clinical rationale and treatment approaches to maximise function, safety and maintain upper extremity health for manual wheelchair users. With so many options, we need to consider all aspects to differentiate and choose the most appropriate product for our clients. Presented By: Tina Roelser MSPT, ABDA, She has a wealth of knowledge and experience and has worked in our industry for over 17 years. Tina has held many notable positions such as Director of Education for The ROHO Group and, most recently Director of International Sales and Education with TiLite. She has presented at numerous global conferences and has experience in sales, market development, training and education, marketing and product development. Please feel free to attend both sessions. 2 May 2019 Case by Case – Taking Wheelchair and Seating Evaluation from Initial Assessment to Final Prescription. Building Confidence through Practice. Manual Wheelchair Prescription and Client Skills training. every attendee will learn the skills necessary to effectively perform seating and mobility assessments, troubleshoot existing seating systems and use these skills to assist clients in the ascertainment of appropriate seating and mobility technology maximising health, function and participation. The APEX - the lightest, fully adjustable rigid chair in its class. Meet Francesca and see what a Klick Tetra can do for you!